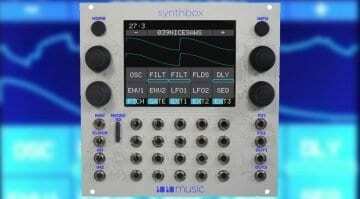 This is Not Rocket Science (TiNRS) has been talking about the RectangularThing since Superbooth. It’s a personal, experimental project into analogue manufacturing that emerged from them playing with the reissued Curtis chips. 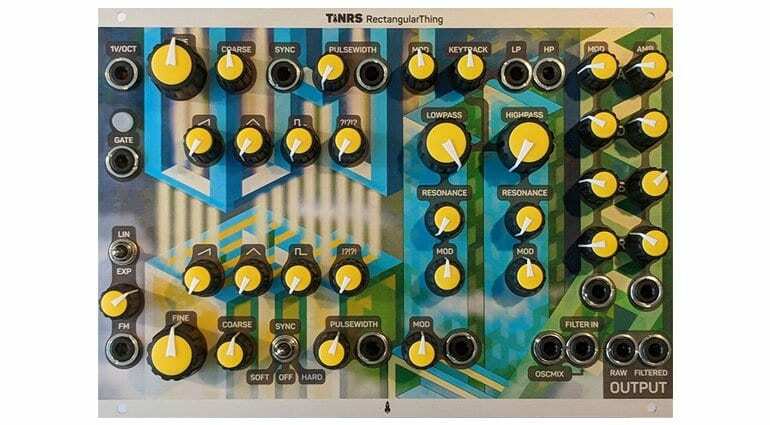 TiNRS came up with something so good that they felt they had to build a handful, and go mad with the front panel artwork. 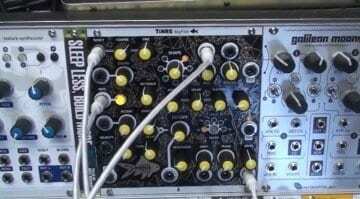 When I say “complete synthesizer voice” I mean that it’s a whole synthesizer by itself in Eurorack form. So you have two oscillators, high and low pass filters, two VCAs, mixer, two envelopes and modulation all in the single module. But it’s something more than that. The RectangularThing has a backend that lets you tweak the architecture of it. You may notice the “!?!? !” knobs. 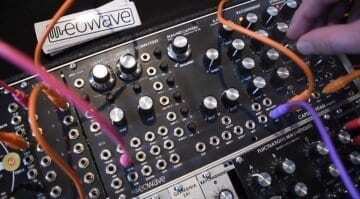 They control the output of the sub-oscillators but you can decide exactly what that means. By arranging jumpers on the back the top oscillator could have a sub or a “Rambler” oscillator (more on that in a moment). The bottom oscillator could be a Rambler, a sub or a “sawpulse” waveform. I really like the mixing facility that you have over each oscillator waveform. You can also mess about with the order of the filters. This “Rambler” is a combination of the two oscillators. It’s a way of generating rich analogue waveforms based on sub-oscillations which switch very quickly between the top and bottom oscillators. The “Sawpulse” is similar but alternates between saw and pulse cycles creating a new waveform. A handy SYNC switch can invoke hard or soft sync between the oscillators. The top one leads, the bottom one follows. When switched to “hard” the bottom oscillator is forced to start a new cycle every time the top one cycles, when “soft” the starting points are gradually aligned. The front panel looks like the 80’s artwork of a poster from Athena – all geometric and jolly. 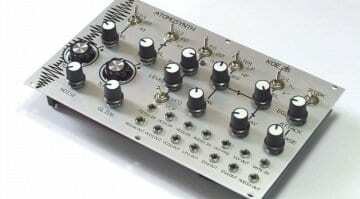 The layout and patch sockets allow for each of the synthesizer components to be addressed as individual modules. They are all handmade and individually calibrated and they are going to make 20 – only 20. They’ve only just finished it and seem to be assuming that they will be snapped up so that they can move onto their next projects. The video below is from the Dutch Modular Fest and gives a good overview along with a look into what they are currently working on. At €700 it places it firmly in Mother-32 and 0-Coast territory but is not too bad for a limited edition and quite unique synthesizer. I hope that some of this Rambler business finds its way into an individual dual oscillator module. If you want one you’ll have to contact Priscilla @ thisisnotrocketscience.nl directly.